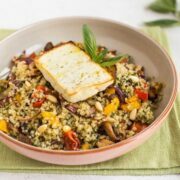 An easy, healthy vegetarian dinner bowl - roasted vegetable quinoa with a fresh homemade pesto, and roasted feta cheese! Crispy around the edges, soft and salty in the middle. Just beautiful. I adore feta cheese – it’s salty, it’s tangy, and it adds a creamy freshness to anything you crumble it over. But that’s where my relationship with feta usually ends – crumbling. I rarely use it in any other way. But not today! This time I thought I’d try something a bit different, and I made roasted feta! I served it over these simple but tasty quinoa bowls, with roasted veggies and an easy pesto dressing. A beautiful, healthy Mediterranean-inspired dinner. – start with some kind of carby base – quinoa, rice, couscous, that kind of thing. Sometimes I’ll use roast potatoes, or even mash, if I want a particularly comfort-foody dinner bowl. – then think about your protein – it can be anything you like. 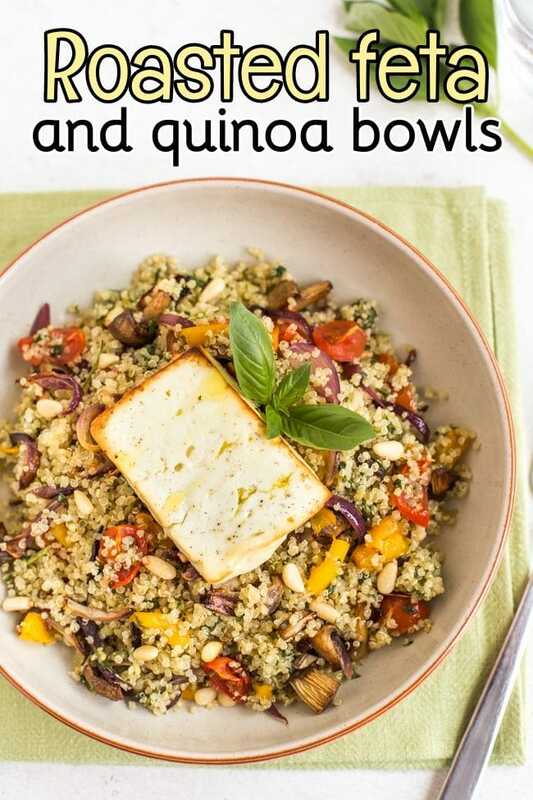 Mix it right through – beans or lentils, tofu, edamame, a meat substitute, nuts, grated cheese – or top your bowls with a ‘feature’ like a fried egg, or this roasted feta. – next, the all important veggies! I usually just use whatever needs using up in the fridge – or, you can think along a specific theme (Mediterranean veg, that kind of thing). – and finally, some kind of sauce or dressing. This time I used an easy homemade pesto to stick with the Mediterranean theme, but just choose whatever you think will go best with your ingredients. An Asian-style soy dressing, spicy hot sauce, even a drizzle of vegetarian gravy! This formula never fails to make a balanced dinner with plenty of yummy bits – just serve it all in a bowl, and dig in. I am lazy. Boiling rice, roasting veg, frying tofu… that’s too much prep for me (and too much washing up!). So I always try to make my dinner bowls as straightforward as I can by using the same cooking method for each ingredient. So if I’m frying my veg in a pan, I’ll throw in some tofu to cook in the same pan. If I’m boiling some broccoli or rice, I’ll also add some edamame to cook right there with it. And since I was roasting the veggies for these quinoa bowls, it made sense to make roasted feta too! 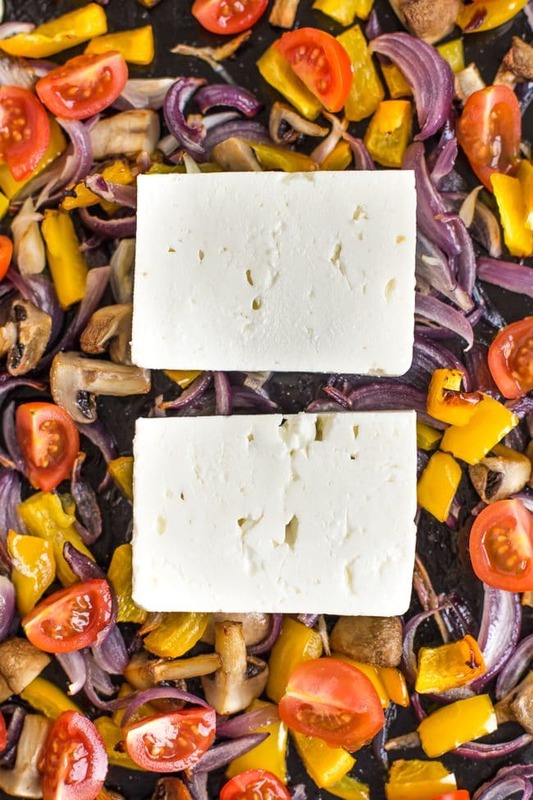 To make this roasted feta, all you need to do is cut the cheese into slabs and pop it right on top of your part-roasted veggies, then return it to the oven for another 20 minutes or so. 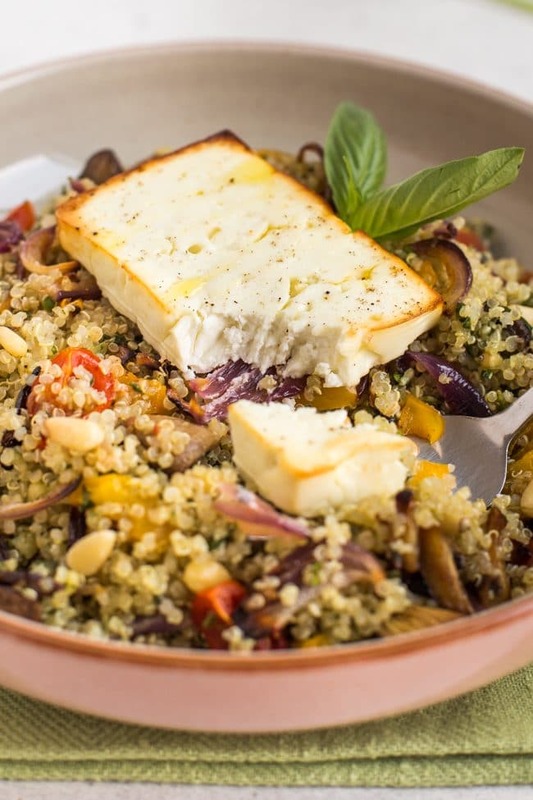 Roasted cheese might sound a little unusual, but let me tell you – roasted feta is amazing! It keeps its shape when it cooks, but becomes somehow a little softer and a little firmer at the same time (?! I can’t decide. Just make it). The edges crisp up beautifully, and the tangy flavour mellows a little, making a really nice feature for these quinoa bowls. Pop it on top of the roasted vegetable quinoa, with plenty of the fresh homemade pesto, and dinner is served! 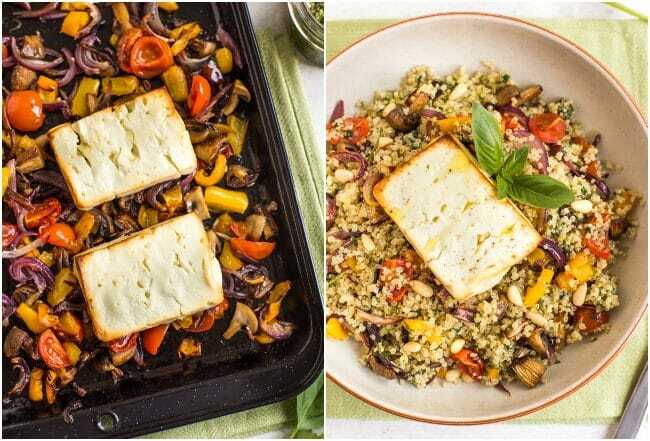 Roasted feta and quinoa bowls – ready! Toss the pepper, onion and mushrooms in a dash of oil, and lay in a single layer on a baking tray. Roast at 190°C (Gas Mark 5 / 375°F) for around 15 minutes, until slightly softened. Stir the vegetables, then add the cherry tomatoes. Top with the slabs of feta cheese, and return to the oven for a further 20 minutes or so. The feta should be slightly browned around the edges. While the vegetables are roasting, boil the quinoa in plenty of water until it is soft and the spiral-shaped germ has detached - around 15-20 minutes. Drain, and set aside. To make the homemade pesto dressing, add the garlic, pine nuts, basil and extra virgin olive oil to a mini food processor, and blitz thoroughly. Season generously with salt and pepper. 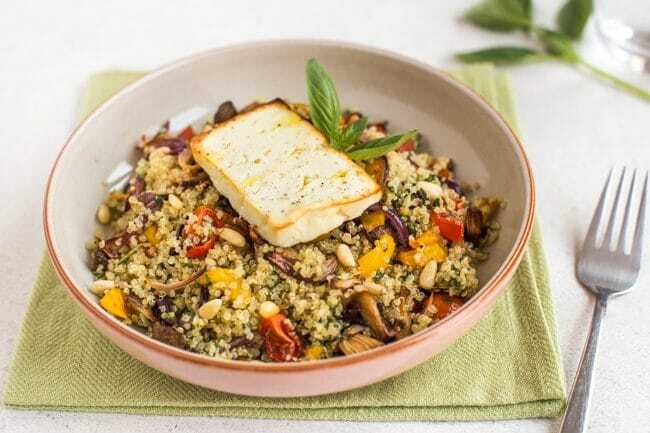 Remove the roasted feta from on top of the veggies, and add the roasted veg to the cooked quinoa, along with the pesto. Mix thoroughly. Serve topped with the roasted feta. Note: Nutritional information is approximate, and will depend on exactly what ingredients you choose. Information above is for 1/2 of the recipe (one bowlful). Bowls like this are one of my favorite dinner options — and that roasted feta throws a whole new spin on it. I’ve never cooked feta before, so I definitely want to try your method. 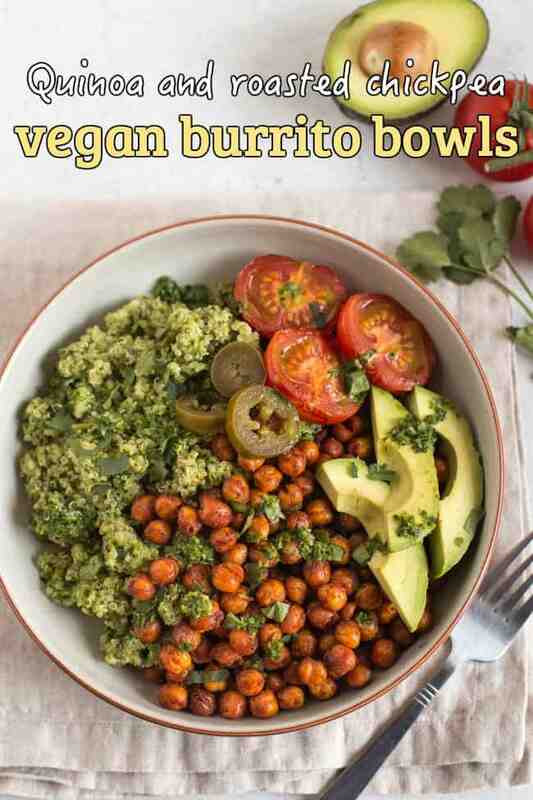 This dinner bowl looks so hearty and flavorful. My family has been eating lots of quinoa lately so this recipe will be perfect for a healthy weeknight meal. Thanks Kelly, hope you like it! I love feta and I bake it in a Greek recipe called ‘bouyiourdi’ but it’s also crumbled. Love the idea of roasting it in a slab with veggies! Yum! Roasted feta? Omg I love feta!! Will definitely try this! I never thought of roasting feta cheese before, I normally just crumble it on top of salads. But this sounds quite interesting, will give it a try soon!